Take a look at this article if you have permissions errors when you try to install global modules. If you're on Windows you have a bit more work to do and I recommend you read the instructions in the npm documentation. If you supply your credentials, create-twilio-function will use them to create a .env that will make them available in your functions. You don't need to supply your credentials if you don't want to, your .env file will just be left blank. 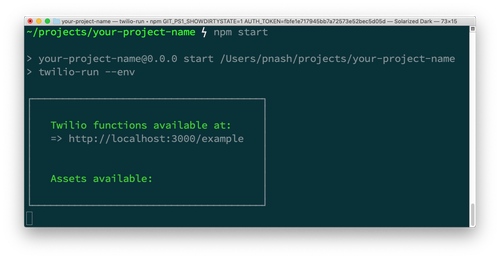 .nvmrc: Twilio Functions currently supports Node.js version 8.10.0. If you are using nvm you can run nvm use and get the right version. Open up the example from functions/example.js to see how it's built. Currently, it is a "Hello World!" application for a voice webhook response using the Twilio Node.js library (which is provided in the Twilio Functions environment) to build the TwiML response. 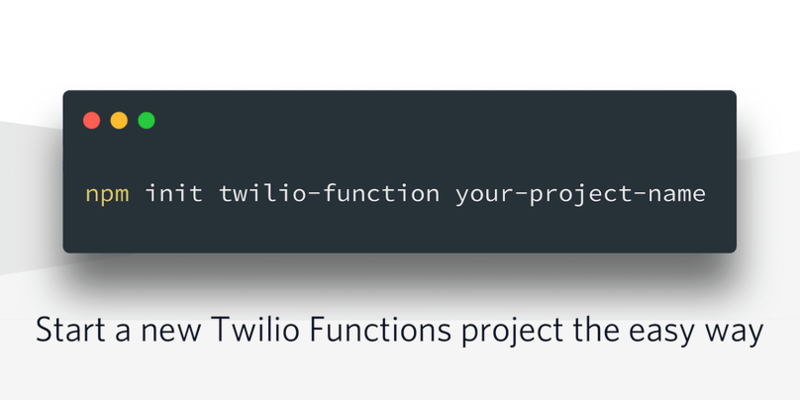 With one command to create-twilio-function and another to npm start we've gone from zero to a full local development environment for Twilio Functions. If you want to learn more about the advanced features of twilio-run, from serving your functions publicly using ngrok to hooking in with a debugger, check out Dominik's post. What about deploying my functions and assets to run on Twilio? Right now, you'll have to copy and paste Functions code and/or drag and drop asset files in the Twilio console to deploy them live. We're working hard on an API for deployment. Look out for that soon, and get in touch with me if you'd like to be one of the first to try it. Now it's your turn to write your own functions. If you're looking for some inspiration, check out my posts on forwarding SMS messages or faxes as emails using the SendGrid API, or translating WhatsApp messages into emoji all using Functions. We're always interested in how we can help you build Twilio applications faster and better. If you have ideas for how create-twilio-function could help more, please let me know in the comments or open an issue on the GitHub repo.